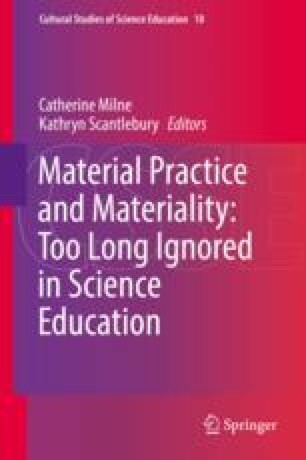 In this chapter I present a comparison of three teachers’ experiences with materiality through laboratory research during a summer professional development program aimed at engaging middle and high school teachers in authentic engineering research experiences. This professional development program provided teachers’ entrance into “science and technology…through the back door of science in the making, not through the more grandiose entrance of ready made science” (Latour, 1987, p. 4, emphasis added) and, consequently, granted direct access to the material phenomena with which scientists and engineers work. Therefore, I explore teachers’ experiences with agential intra-action (Barad, 2003) in these settings, as well as the extent to which the teachers translated such experiences into their own classroom teaching. Giere, R. (2002). Scientific cognition as distributed cognition. In P. Carruthers, S. Stich, & M. Siegel (Eds. ), The cognitive basis of science (pp. 285–299). New York: Cambridge University Press. https://doi.org/10.1017/CBO9780511613517.016.